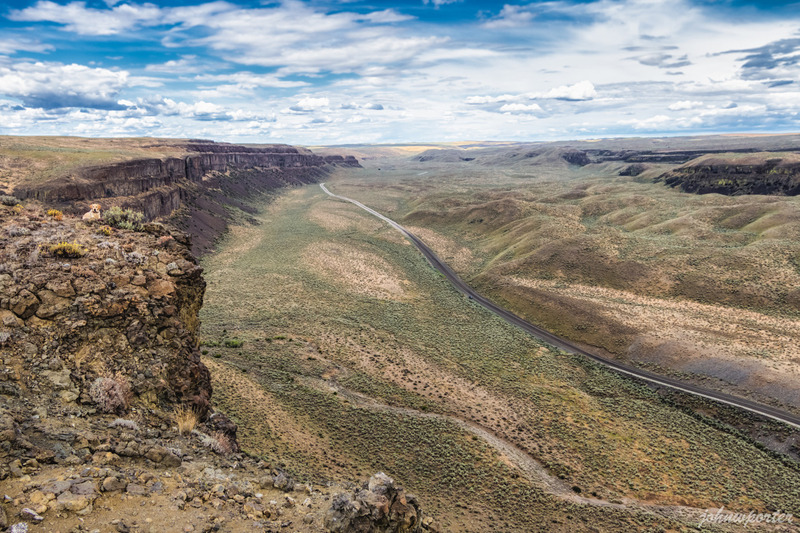 I remember driving on Highway 2 and seeing the opening of this part of Moses Coulee on our way home from visiting Monument Coulee. As the highway dipped down into bottom of the coulee, I looked to my right and was surprised to see it, but I knew I had to come back. Later when I checked my hiking book and WTA, the coulee was listed in both places. Not sure how I missed it all this time! Parked at the parking area per directions from the hiking book. Immediately I wanted to figure out a good way to get to top of the coulee walls to walk along the rim for better views. It appeared that just to the left of the nearly dried up Dusty Hill Falls, a faint hikers path lead to the second tier of the cliff wall. First off, I wouldn’t recommend going this way to get to the top. Where I parked the car, I spotted a possible route up at the east end just before reaching Jameson Lake. In the end this turned out to be our way back down. BUT if anyone decides to go this way, I would highly recommend wearing a helmet as a class 4 move with enough exposure was required to get to top of second tier. From there, pup and I walked in between coulee walls to a pond nestled about 100 feet inward from top of the falls. The only good place I found to get up to the top tier was to the left of the pond, but even that required several big steps of class 4 climbing. There was a rope and a metal wire dangling from top of the rock, which people had used to pull themselves up the nearly vertical yet steppy wall. I didn’t trust either as they looked pretty worn out, instead I looked for solid holds for pup and me to get up that way. Once we got to the top, we traversed southward for a bit until we encountered a fence. This usually meant private property on the other side and I didn’t want to get us on trouble by going any farther. After getting some photos we turned around and started traversing northward, over top of the pond, and moving eastward to east end of the rim overlooking Jameson Lake. We traversed northward for half a mile to a place overlooking majority of the lake and made that our turnaround point. Jameson Lake was pretty sizable, and I didn’t realize there was a resort set up on the south end. The area was really nice and quiet and I was glad not to see any water activities to ruin the silence. Reversed our route on the way back and found the aforementioned place at the east end of the coulee walls to get back down onto the road. Then uneventfully walked the road for a while before switching to trails west of the road, half a mile before the car to finish our trip.